Borderlinx | Buy Speedo and ship worldwide with Borderlinx. Cheap rates guaranteed. Today, Speedo USA is one of the most recognized brands in swimwear. With a reputation of offering the highest quality swimwear, Speedo has been crafting its products for over 80 years, and sells more swimwear than any other swim apparel company in the world. Speedo USA has been worn by anyone looking to improve their game in the water, be it an Olympic athlete, or a recreational swimmer. Offering a plentiful selection of products, Speedo USA swimwear is available for men, women, and kids, accompanied by an exciting line of training gear, t-shirts, footwear, and more! Speedo USA has been trusted for decades as the go-to swimwear manufacturer for just about anyone interested in making a splash. With styles tailored to application, Speedo USA suits come specialized for racing, recreation, lifeguarding, and more for swimmers of all ages. Many suits are available for under $50 to make the time-tested brand accessible to just about anyone, and Speedo USA is proud to carry a large selection of accessories from goggles, to fins, to snorkels, to even waterproof music players and digital cameras. Whatever underwater activity you have planned, Speedo USA products are there to help make it happen. 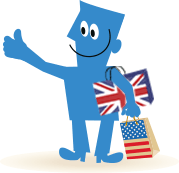 Now, international customers can buy Speedo in the US with Borderlinx! Cheap shipping, tax & duties are calculated upfront by our Shipping cost calculator, and Borderlinx will then ship your order to your home. Concierge, free repacking and consolidation services are also available through Borderlinx to make international ordering from Speedo USA hassle-free!